This trip turned out much better than expected! From a distance, the peaks appear to be rubble piles. There is rubble aplenty, but there are also some of the best meadows and slabby streams you'll find anywhere. The company was enjoyable and we got all the peaks. We took the Bear Creek Diversion Dam trail, which starts off as a dirt 4WD road leaving the pavement about 3 miles south of the Edison lake dam (waypoint 4WD0). This road is marked with scary signs, and previous visitors have told me that it's really a bad road, but there were Honda sedans at the end of it. A little over 2 miles from the pavement (waypoint 4WD3), you come to a large parking area with flat slabs this way than taking the ridge from Lake Edison when you consider that the creek trail is downhill all the way out. Lots of people car camp at the trailhead and go fishing, but most of the backpackers we saw were on the Pacific Crest / John Muir trail which intersected our route at waypoint BEAR6. Bear Creek was the biggest surprise of the trip. It's gorgeous! Huge deep pools are mixed with cascades that thunder over slabs, with the occasional sandy beach large enough for group camping. Lots of big trees rounded out the experience, making me think that maybe packing in a lawn chair and a cooler wouldn't be so bad after all. We saw a trail marked "Edison Road Cutoff" at waypoint BEAR0, but it's not clear whether this climbs over Bear Ridge or simply bypasses the 4WD road. Has anyone reading this taken that trail? It's not on the map! The stream was so beautiful at 9150' that we spent over an hour for lunch, Sadly, our trail left Bear Creek (at waypoint BEAR8) and turned up the Hilgard Branch. Happily, it was just as wonderful although smaller. This is the sort of trail where you can find a great place to camp within 20 minutes of wanting to stop, pretty much without any advance planning. We had planned to camp at the stream from Hilgard Lake, climbing Recess the next day, but found that we were doing better than expected at a moderate pace - so we tromped on up to a much better campsite at waypoint ITALY2 near where the streams from Beartrap, Teddy Bear, and Lake Italy come together: flat slabs and sand right by the stream, with a cool view down the valley and up to Hilgard. Day 2 saw us up with the sun. Actually slightly before the sun, which required my preschool morning song to fully rouse everyone. They may not have enjoyed it, but they got up! Anyway, we headed pretty much due north that breaches the cliffs just EAST of the two talus chutes you can see from the stream. The footing was fair in this short chute, which tops out east of Lake 11960 (waypoint GABB9), and then it's good but sandy footing most of the way to the peak. Tom hit the altitude wall at 12400' and turned back. It didn't seem that Tom could summit comfortably that day, and we all decided that getting out a bit early was worth trying to cram a second peak into our second day, so Linda and I sped up to go over Hilgard and get Gabb. On the summit of Hilgard (waypoint GABB8) at 10am, we were psyched about how easy the climbing had been and how much time we had left to bag the second peak of the day. That elation was short-lived, as we started down the southeast chute and crossed onto the east face. Mistake. Very difficult hard-scrabble. 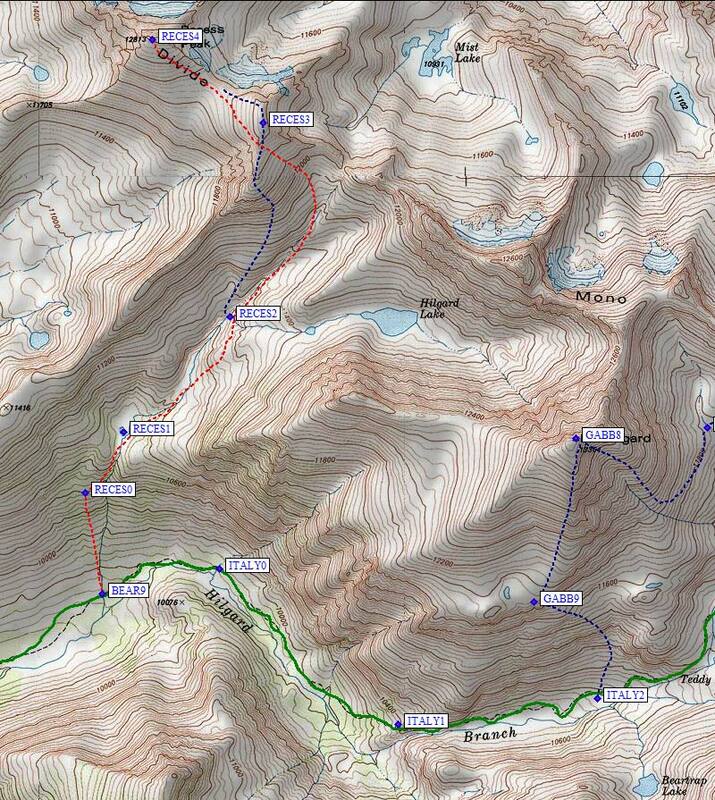 We should have stayed in the sandy chute until we got below 12000', then started the traverse (blue line on the map). The footing in this chute is loose, making for a fast descent but a terrible climb. We stayed at 11800 all the way to the ridge which could loosely be called the south ridge of Gabb (near the middle of Lake Italy, waypoint GABB6), then did a short bit of low class 3 to get on the ridge and traversed into the bowl south of the summit. 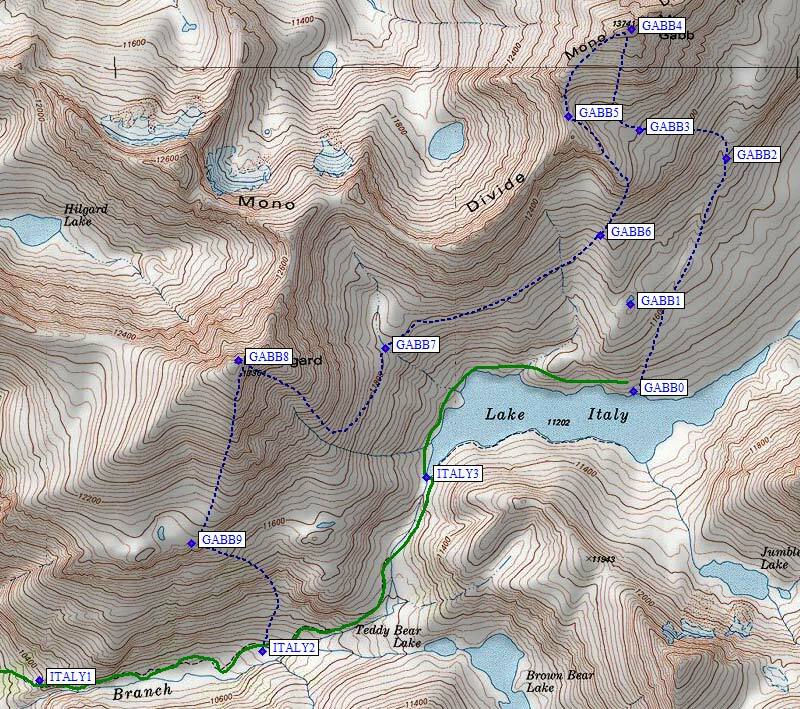 (The third class is easy to avoid by continuing the 11800' traverse around the end of the ridge to our descent route.) The bowl is loose sand and boulders, not so great on the way up but good ski pole vaulting on the way down. We rested on the summit of Gabb (waypoint GABB4) from 3:00-3:45pm, taking in the view and reading the register, then headed back into the bowl and jogged east to get around some cliffs on easy slabs. There is a wet spot / creek which does not show on the map but which leads through a defect in the slabs all the way to Lake Italy (waypoint GABB2 to GABB0), and by this point we were ready for some grassy walking! Italy is HUGE. It was a mile to the outlet, and the sun went behind the ridge as the water turned our discussion to sailing and people in our past lives. We picked up the use trail on the south side of the outlet stream, and kicked over ducks all the way back to camp. In places there are three rows of ducks up the valley (at least two of which are marking the wrong path, eh?). Dinner and daylight ended together, and another night of the Perseid meteor shower capped a perfect day of climbing. Remote high altitude campsites and bivy bags really ARE the best way to observe these celestial events, if you can keep your eyes open after a 5000' day. On day 3 we packed back down to the stream from Hilgard Lake (waypoint BEAR9), ditched our packs and shouldered daypacks. We actually tried to traverse over to the stream from the trail, but should have just stayed on the trail until we reached the west side because there is a brushy swamp on the east side. The west side, by contrast, is duff and slabs which provide easy walking if you don't try to stay too close to the stream. Just as the stream levels out at a meadow, we squeezed around cliffs (still staying on the west side) and popped out into the best extended high altitude meadow available (waypoint RECES1). On the way in, we stayed well east of the stream from 10600' to where the Hilgard Lake outlet stream joins in at 11100'. That's the best choice (red line). On the way down we stayed in the main drainage and had to hop a few boulders. Not too much of a difference, but it's probably faster staying up on the east side a bit. From the stream junction at 11100' (waypoint RECES2), we contoured up into a chute on the south ridge of Peak 12640. This was a mistake (blue line). Up high, the ridge turns into huge class 3 blocks. On the way down, we stayed in the southeast bowl all the way to the headwaters of the stream we followed up from the trail. Much better (red line)! There are slabs and grass and wildflowers instead of sand and rock. You can bypass Mist Peak (12640', waypoint RECES3) on the west, saving over 100' of climbing, but if you go to the top you'll find a tattered register in a glass jar claiming that Peak 12640 is actually called Mist Peak. It overlooks Mist Lake, so this seems like a fine name, but I was hoping to call it "Nap Time" since it's a little version of Recess. Too bad. The SPS got there with a register first. Secor's book contains an error here, saying that you should descend the northEAST side of Mist Peak. Maybe with a rope! The northWEST side is the class 2 side, and leads easily to the saddle between Mist and Recess. From there to the summit of Recess is class 2 no matter where you wander (but wander west across the face, since that's where the register is and you'll have to boulder-hop the ridge to waypoint RECES4 otherwise). I should mention that Tom doesn't normally do 3600' days, especially at altitude and with a lot of cross country miles, but we paced the day well and with a few words of encouragement he did just fine. We got to the top at 3pm, right at our turnaround time, but hung out half an hour to savor the moment. Once again dinner and daylight ended together, but this time we were camped low enough the bugs drove us into hiding. A short hike out on day 4 ended with cold beer from Tom's thoughtfully stocked cooler (which actually kept ice for 4 days, aided by a sleeping bag wrapped over it) and a return to the Bay Area just in time to fight rush hour traffic. Waypoints - see trailhead page for driving waypoints!